I upgraded to version 2 and all of my cards reset to the standard font size. Since they are small Chinese characters on a large iMac screen, the result is practically unreadable. I found I can go in and edit individual cards to the extra-large font size, however, the with the amount of cards I have, this is extremely impractical. Why has the case setting options been disabled in the new version? Is it coming back? 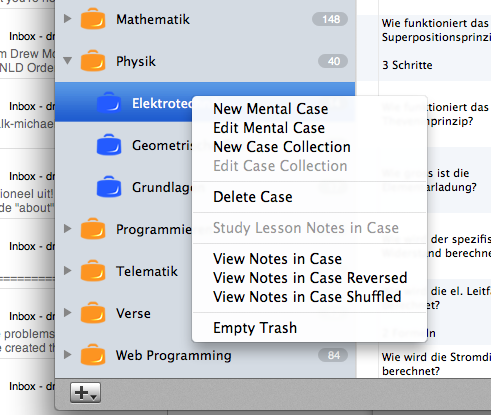 I'm a bit confused, because Mental Case 1.9 never gave you any control over font size at all. - Setup one note exactly like you want it. You can change font size on the back of the facet in editing mode. Click the cog button to flip the facet over to do this. - When you have everything the way you want it, click the 'Make template' button (stamp) in the toolbar at the bottom. Give it a name. - Now click Done, and go to the 3D note browser. Select all the notes there (Command A). Choose Notes > Apply Template and select your new template. This should change the fonts etc in all of the selected notes. Thanks for the help. Applying the template made the cards much more readable. I know version 1 didn't have direct control of the font, but by right clicking on each case you could set it as small, medium or large. Version 2 has more control. However, I just couldn't figure out how to apply it to a batch. Are you sure you are thinking about a Mental Case feature? I can't remember anything about setting text size to small, medium or large. I also don't see it in the menu that pops up when you right-click on a case (see screenshot). I don't have 1.9 on my computer anymore, but there definitely was a way to choose between small medium and large fonts during a slideshow, and the font size could be set individually for the front and back. You do have that on the iPhone, but the Mac version never had it. On the Mac you could choose different themes, and some had a bigger font. Maybe you are confusing the iPhone/iPad app. Drew, I have the same issue. I think Gary is talking about the slideshow templates that we could create or alter in 1.9. It allowed us to define the font and font size for the slideshow. Now, we have to specify every single card individually. If there was some sort of "mass editing" feature in 2.0 I think this would suffice for this issue. So we could choose a bunch of cards and change the prompt font and size for all of them. Ahh, nice! Gary, set up a new template for your cards, and apply them to all of your cards. The MC help files has info for setting up your template.